Charles Portelli, from the architectural firm Kohn Pedersen Fox (KPF), dropped by our office and we got to hear about some of KPF's latest projects. 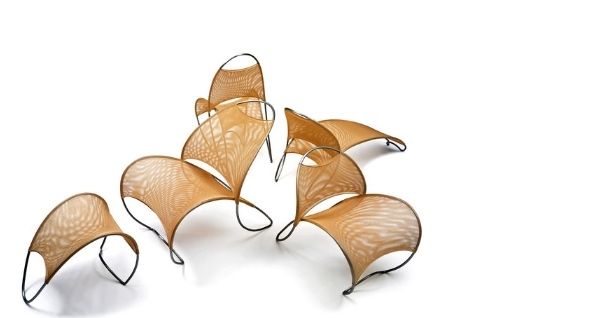 One deviation from the large architectural projects we expect from KPF is this intriguing furniture line, Loop de Loop. All modeled in Rhino and rationalized in Grasshopper. 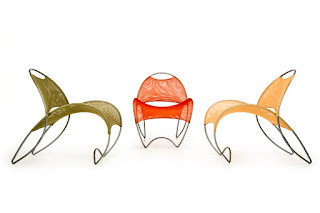 The five-piece collection, designed by William Pederson, founder and partner of KPF, works for both outdoors and indoors with its polyester mesh and powder-coated carbon steel rods. The non-elastic knit is deforms equally, no matter the person's size. Each piece is a single loop of 5/8" high strength tubular steel, passing one end of the loop through the other -- Loop de Loop! In a New York Times article, Pedersen elaborated, "We digitized them into a program that uses CNC technology to bend the 5/8-inch high-strength carbon-steel rods into continuous loops. There are 40 individual commands, and every inch or so along each tube the computer commands a change in the bend. It's like squeezing a tube of tooth paste: You change the pressure, and it changes the angle."